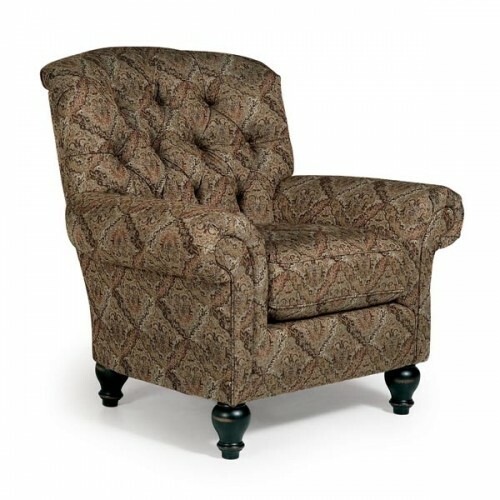 The traditional Christabel club chair is perfect for the study or a handsome den. The arms slightly flare outward, offering smooth lines for nothing but comfort as you sit back into the plush button-tufted back. The precisely carved feet come in an Antique Black, Distressed Pecan, or Riverloom finish to complement whatever fabric covering your choose. It is this type of attention to detail that sets Best apart from the rest. Matching ottoman available. Unit Weight (lbs) 47 Seat Width 21.5"
Unit Width 41.5" Arm Height 25.5"
Unit Height 39" Seat Depth 21"